Alexa announced a new service a few days ago. Their What's Hot on the Web service aggregates data from all Alexa toolbar users to provide a list of the hottest, i.e. the most visited, links of users who have the toolbar installed. One could say that it is similar to Digg but with a lesser chance of manipulation and an even greater preference of popular news sites like Yahoo, MSN or The Times Online. The What's Hot on the Web currently features three pages with a total of 50 links and links to many empty pages at the bottom which will surely be filled over time. Even more surprising than the empty pages is that the link to page 2 is missing. Visitors can access the homepage which contains the 20 most popular stories "right now" and then head over to page 3 since page 2 is not visible anywhere. Visiting page three however displays an url that can be manipulated to be able to visit the second page as well. Simply changing the 3 at the end to a 2 will load the second page with the links 21-40. 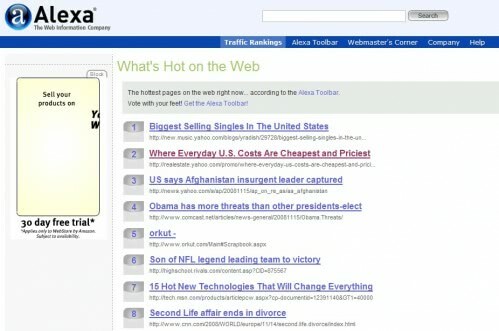 Alexa's What's Hot on the Web provides another nice overview of some of the hottest topics on the Internet currently. It's basically similar to services like Google Trends, Delicious Popular or even Digg. If you like those kind of sites you will also like this one. Update: The What's Hot page has received slight modifications in recent years. Alexa is still displayed the top 20 list of what is hot on the page. These topics lead to ten web articles about the topic. A click on the topic opens it on the linked website. Hot Products appears to be a more recent addition. It lists ten high in demand products, again with links to websites about those products. I don’t know about this. I remember Alexa as a spyware vendor that had a toolbar that took an expert to uninstall. Now that was a few years ago. Is it the same people running the firm now? If so, thanks, but definitely NO thanks.